From humble beginnings on a farm, with one tent and a handful of displays, the Kansas Sampler Festival has grown into a must attend event over the past 28 years. Milferd Penner and his daughter Marci Penner started the festival on their farm near Inman, KS in 1990. Originally, the event was a book signing for their newly published guidebook Kansas Weekend Guide and it featured a few displays from destinations promoted in the guide. With over 1,000 people in attendance, the Penners quickly recognized that people were thirsting for knowledge of things to do and see all over the state and decided to form the Kansas Sampler Foundation. The festival was held at their farm until 1998 when it was decided that the festival would travel around the state, hosted by different towns and communities. The host city would be selected for a two-year run. They would do all the work to run the event, from gaining sponsors, organizing exhibitors to providing entertainment and food. Each host city would put their own unique twist on the festival, much to the delight of travelers and tourists. Since leaving the Penner farm, 10 cities have been selected to host the event: Garden City, Liberal, Pratt, Concordia, Wamego, Newton, Independence, Ottawa, Leavenworth and the current host, Winfield. Each has had a chance to welcome thousands of visitors to their communities. In addition to showcasing what their city has to offer, it gives other cities throughout the state a chance to share information on their own attractions, historical sites and events. 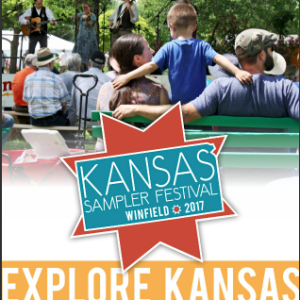 This year at the Kansas Sampler Festival you can expect to see some great things in Winfield. Representatives from over 140 towns and cities will have information on what their cities offer. In addition, there will also be 24 Kansas musicians and performers, more than 20 food trucks and vendors, a petting zoo, kids crafts, historic performers and more. There will be hand-crafted Kansas products for sale from more than 40 Kansans as well as a Kansas beer and wine tent. The 2017 Kansas Sampler Festival will be the last year of the current format before major changes are made. In 2018, the Kansas Sampler Festival will turn into the Big Kansas Road Trip. A specific area, a city or county, will be chosen and tourists and travelers will flood the area to explore everything from local attractions to the hidden secrets only known by locals. Come and enjoy the festival one last time on May 6 & 7 at Island Park in Winfield, Kansas. Find Visit Topeka in the Northeast Kansas Tourism tent to find out the latest and greatest things to do in Top City. For more information about the festival visit their website here.